In January, Ontario’s minimum wage will increase to $14 an hour, up from $11.60 today. In January 2019, the wage floor will increase by another dollar to $15 per hour. There are good reasons to worry that such a rapid increase in the minimum wage (an increase of more than 30 per cent in less than a year-and-a-half) will have undesirable unintended consequences. Specifically, the evidence suggests that a much higher minimum wage will have a negative effect on job creation in Ontario’s economy, with the effects being heavily concentrated on young less-skilled workers. Although research from the United States is somewhat mixed, the Canadian evidence consistently shows that minimum wage increases produce adverse effects on employment for young and less-skilled workers. What’s more, international evidence shows that as the minimum wage climbs higher relative to the median wage in any given jurisdiction, the disemployment effects tend to become worse. On this important metric, Ontario is set to move well out of line with other Canadian provinces and nearby U.S. jurisdictions with whom Ontario competes. Most Canadian jurisdictions have minimum wage levels that are about half the provincial median wage. In fact, large provinces are very tightly clustered around this benchmark. Alberta’s minimum wage is 53 per cent as high as the provincial median wage, and British Columbia’s is 49 per cent. The current minimum wage in Ontario is 51 per cent of the provincial median and in Quebec it’s 52 per cent. But with increases over the next two years, Ontario’s minimum wage will soar to 64 per cent of the province’s median wage. This will put Ontario well out of line with prevailing Canadian norms. Just how severe the resulting employment losses will be is difficult to predict, because there are so few examples of similarly rapid minimum wage hikes to such a high level in recent North American history. However, given the consistency with which the Canadian evidence shows higher minimum wages produce disemployment effects, and the fact that those effects become worse as the minimum wage rises higher relative to the median, there’s good reason to be concerned that the disemployment effects will be substantial. And, again Ontario’s minimum wage (relative to its median wage) will soon be out of line not only with other Canadian provinces but also the province’s U.S. neighbours. As the chart below shows, the statewide minimum wage for nearby U.S. states tends to be between 41 per cent and 51 per cent of the median. 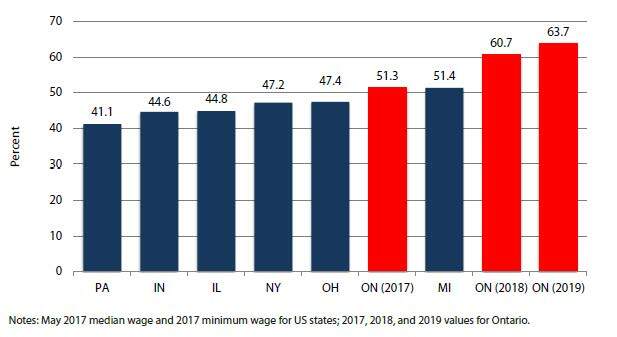 As noted, Ontario’s minimum wage-to-median wage ratio will soon be 12 percentage points higher than the highest minimum wage of any nearby state, which is Michigan at 51.4 per cent. Clearly, with a $15 minimum wage, Ontario is entering largely uncharted waters, which makes the precise effects difficult to predict. However, there are good reasons to be concerned about the effects, especially for younger and less-skilled Ontarians.